During the Grand Coulee years, four more of the Smith children got married. The first two of these weddings made a double connection between the Smiths and the Wanamakers. In January 1915, Prue married Roy Wanamaker, at the Smith family home. 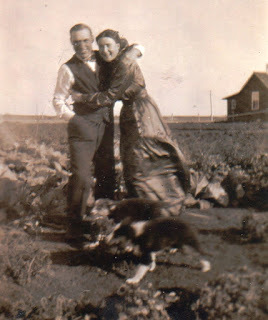 They were both aged 21 at the time, and Roy had saved enough money to buy his own farm at Grand Coulee, where he and Prue lived for many years. Their first house there wasn't in very good shape, letting the wind howl through. Roy patched it up, and then built a new house on the same land several years later. He worked as a telephone linesman as well as looking after the farm, with a lot of help from a very able Prue and at least one hired hand. Roy and Prue had no children, but they had a wonderful marriage that lasted 75 years. Roy and Prue's wedding photo, 1915.
taken in the summer of 1915. Their first house is in the background. Ryley and Myrtle's wedding photo, 1915. In December 1915, Ryley Smith married Roy's sister Myrtle Wanamaker, at her parents' home in Grand Coulee. He was 24 years old, and she was only 19. These were my grandparents, so I know a fair bit more about them than any of the other Smiths or Wanamakers. I intend to write about them in detail later, but for now, I'll talk about their wedding as it relates to George. George's intention as his kids were growing up, was to set up all three of his sons on farms (and let his daughters' husbands look after them). But he didn't give his sons any land - he had taught his children to earn their living and use their money wisely, as he did. So Ryley rented a quarter section of George's land in Summerberry (no doubt at a very reasonable rate) and when he could afford to buy it, he did. I don't know what George and Louisa's other children received as wedding presents from their parents, but I imagine they were substantial, because Ryley and Myrtle's wedding present was a house. I think the story of this house deserves a blog post of its own - should I do that now or later...? Soon. 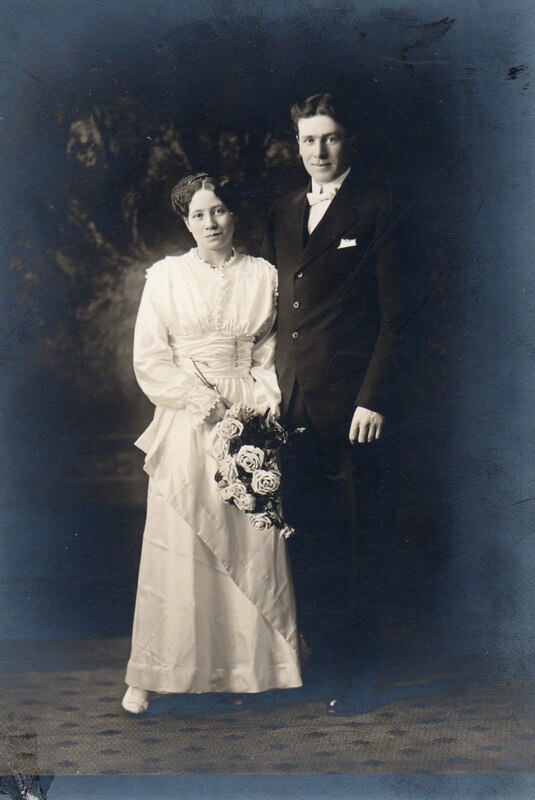 In March 1918, a double wedding took place at the Smith home. Grace married Andrew Mowat, and Ethel married Frank Burton. Grace had met Andy some years before when he worked as a farm hand for Clara and Archie Adair. Andy moved around a fair bit in those years though, so it took awhile for him to get around to settling down. He was 29 and Grace was 31 when they married. They farmed near Sintaluta for awhile and later rented the Adair farm at Indian Head. 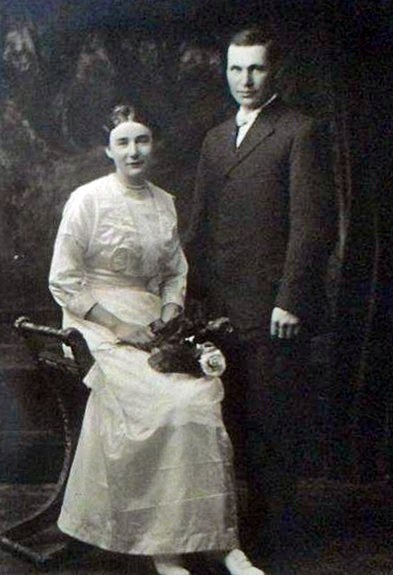 Ethel married young - she was just 20 and Frank was 24. They farmed first at Grand Coulee, and later, northeast of Regina. 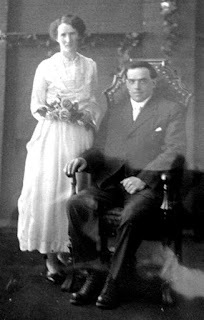 Frank and Ethel Burton's wedding photo, 1918. Clara's obituary in the Indian Head Times. No doubt this double wedding would have been a particularly happy occasion for all concerned, if it hadn't been for one terrible thing. The girls' eldest sister Clara was to have attended them at the wedding, but she'd been 'in delicate health' with a rare disease of the spleen for some time, and had a sudden downturn shortly before the wedding. When it seemed that the hospital in Regina couldn't help, her husband Archie took her to the Mayo Clinic in Minnesota in hopes of saving her. But Clara passed away there a few days after her sisters' wedding. Despite the sad start to two of these marriages, all four of them were happy and long-lived, just as George and Louisa's was. Like Roy and Prue, Frank and Ethel had no children, but Andy and Grace had two, and Ryley and Myrtle had eight, including my mother. More about them later. Everything I know about these events come comes from newspaper articles and what's been told to me by family members.